TEACHINGS FROM THE RAMAYANA -"RAMCHARITMANAS"
As is the belief of the Bhagavad Gita, the Ramcharitmaanasa too teaches that even a little devotion pleases God. In the beginning of Baal Kaand Tulsidas says, God's bhajan, even though little, takes one across the ocean of birth and death (Baal Kaand Doha 12: Ch:1). Similarly after narrating the various ways of devotion, Rama tells Shabari that the living being who practices even one of these is very dear to Him (Aran. Kaanda Doha 35: Ch: 5). Likewise, as the Gita had classified four kinds of devotees: "The virtuous ones, O Arjuna, who pay homage to me are of four kinds - Firstly, the man in distress, Secondly, the seeker of knowledge, Thirdly the one who desires wealth, and Fourthly the man of wisdom" (Bh. Gita. Ch: 7. V:16). Even so the Ramcharitmaanasa speaks of devotees of four kinds, "In the world there are four kinds of devotees Rama, and all the four are virtuous, benevolent and free from sin". Firstly there are those who take His name to acquire wealth etc., Secondly, those taking His name to avoid distress, Thirdly, those taking His name in order to realise him, and Fourthly those who remember him out of love. Japhi Naamu Jan Aaarat Bhaaree / Mitahin Koosang-kat Hohin Sukhaaree. Devotion in any form is acceptable to God, even if the aim, of which is to bring some material good to the devotee or to mitigate some misfortune. It would be much better if the Sadhaka habituate himself to expect everything from God whatever he wants and do not be too dependent on man only for everything. This habit will give you more peace of mind and self reliance. Aaakar Chaari Laakh Chau-raa-see / Jaati Jee Jal Thal Nabh Baasee. Siya Raam-mai Sab Jag Jaa-nee / Karoohn Pranaaam Johri Jug Paani. When Sutikshana, a disciple of the venerable sage Agastya, saw Rama he invoked him as the storehouse of mercy. The sight of Rama so filled Sutikshana with the ecstasy of devotion that he completely forgot where he was and what he was doing. "He can't see the path or where the path turns, nor the way. He can see nothing. He even forgets his own existence. Sutikshana is an example of the devotee who has reached the satge when he sees the world enveloped by God --- Rama-maya. Describing the Lord's nature, Krishna explains to Arjuna in the Bhagavada Gita, "Virtually, therefore, it is from Me that the Universe originates and in Me that it dissolves. There is nothing above Me. Everything rests on Me as a row of pearls does on a string." (Bh. Gita. 7: V: 6 & 7). One of the main teachings of the Ramcharitmaanasa is that the Sadhaka or aspirant sees Rama in all things. The entire world is enveloped by him. So Shiva tells Parvati, "O Uma! Those who are devoted to the feet of Rama, and are free from passion, arrogance and rage, see the universe filled with God alone. So does Kaakbhushundi tells Garura "O king of brids, listen, those who seek happiness by means other than God's devotion are devoid of any Bhakti. They wish to cross the mighty ocean of birth and death without even a ship! (Uttara, Doha 114B: Ch: 2). Perhaps the greatest and most unique teaching of the Ramcharitmaanasa is its emphasis on the chanting of God's name as the means of deliverance. Rama's name is the miraculous potent power which brings comfort to troubled souls like those of Bharat --- "Jiha Naamu Japa Lochan Niiruu (Ayo. Kaanda. Doha 325. Ch: 1). And Rama Rama Raghupati Japat Sravat Nayan Jaljaat. (Uttara Kaanda. Doha 1B). When Hanuman while flying with the Sanjiivanbuutii -- life giving herb is accidentally struck down by Bharat, he utters Rama's name while falling --- Sumirat Rama Rama Raghunaayak. (Lanka Kaanda Doha: 58: Ch:1). It is Rama's name which makes the building of the bridge across the ocean possible, thus enabling his army to get across. Naamu Raam Koh Kalpatroo Kali Kalyaan Nivaasu. Joh Sumirat Bhayoh Bha-ang Te Tulasi Tulasi-daasu. In his masterful exposition Tulasi demonstrates the superiority of the sacred name of Rama himself. Even by repeating it backwards the sage Valmiki was purified and reached a high stage of devotion. It is the easy way to liberation or emancipation, and realising this even great gods like Shiva keep chanting Rama's name. Shiva says to Paarvati, 'O Paarvati, by the power of whose name I give to those who die in Kaashii the mantra of Rama, thereby relieving him of sorrow --- he indeed is my Lord Rama. Indisputably so, gods like Shiva and Sages like Narada know its virtue. Rama's name is an exlir and tranquilizer to life in man's quest for peace and self-realisation. In the Kaliyuga particularly the chanting of Rama's name has great significance and merit. 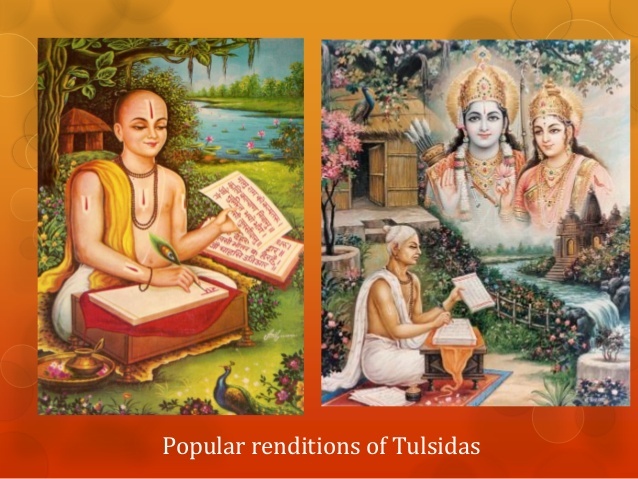 In Satyuga, says Tulsidasa, God can be pleased by meditation, in Treta Yuga by penance, in Dvaapara by worship; but in the Kali Yuga Adharma or unrighteousness has reached the limit. (1) Sat Yuga --- 1,728,000 years. (2) Treta Yuga 1,296,000 years. (3) Dwapar Yuga --- 864,000 years and in (4) Kali Yuga ---- 432,000 years. Up to 2016 Kali Yuga has finished 5,116 years. When Rama offered the mortally slain Jatayu his life, he refused it because the same Rama by taking His name at the hour of death, even the worst of us may achieve liberation. However, Shri Rama was already standing before Jatayu. This being so there was no reason for him to keep his body any more. As an Avatar - divine incarnation, we have seen the redemption of Ahalya, Shabari, Jatayu, Vibhishana, Hanuman and so forth by the divine touch of the God incarnate. The Brhadaaranyaka Upanishad gives the drum (Dundubhi) as an example. The same drum gives out many kinds of sound. some may frighten us, others would make us dance. If we are to Master all these emotions, we have to catch hold of the drummer. Once he is in our hands, all the notes too are in our hands. In one word the Lord says:- "Those who wish to cross maya, let them take refuge in Me". Only those who surrendered to Me will escape the play of Maya; for them, the waters of Maya dry up here and now. Mahatma Gandhi was devoted to the name of Shri Rama, so much so that he uttered the name of Shri Rama ( Hey Ram ) as the assasins bullet hit his frail and emaciated body. Always endeavour in your efforts to be absorbed in meditation, Jap, study of the scriptures, worship and devotional music. What then is this that we call Maya? The power of God, His art, the skill of His hands. This is what we call Maya. God's creation, the living and the non-living formed this many coloured world, the glamour and glitter which delude us so much that we often accept the unreal as real things.